The N.C. Chronicles. : Sometimes I get attention, not that it bothers me. Sometimes I get attention, not that it bothers me. I get the attention of feminist web sites from time to time, usually vicious banshee rhetoric which I do not pay attention to. Sometimes they are just someone pointing out, according to them, that I hate or that the site is sexist...well I don't hate anyone, and I have daughters, so I can't be sexist. Minerva here did not read what I wrote or meant, if I bring up feminist hypocrisy, then it is all hate and sexism...typical feminist. "I'm Minerva McGonagall. I reblog sexist posts and frown at them. Feel free to send me the link to a misogynistic or misandrist post and I might frown at it for you." 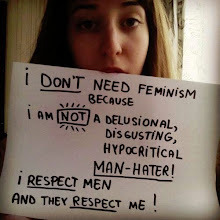 (Admin is not a feminist or MRA, just someone who is tired of people's hateful pettiness)RIIIIIIIIIGHT! What I really pointed to in this tumblr post is how she tried her best at reducing anyone who was against her policies as a woman hater. The little time she was in office, she tried to blame everything on men, it's all men's fault, but yet, we learn that even julia gillard needs a man to comfort her, nothing wrong with that, we need women ourselves, but we are not hypocrites about it. I don't think it was sexist, anti feminist maybe but not sexist. Minerva can "pretend" she is doing good, but she or he should read first...the post I put up had nothing to do with sexism, pointing out the contradiction was the objective. Funny how these type of people are only anti-sexism when it comes to women. When men are discriminated against,you don't say a word. "They" don't say a word.